Visit the world through the neighbourhoods of Toronto. The United Nations calls Toronto the most multi-cultured city in the world. 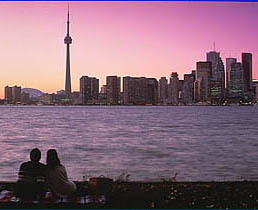 With more than 100 cultures, Toronto is North America's most multicultural city. There are two official languages in Canada - English and French. 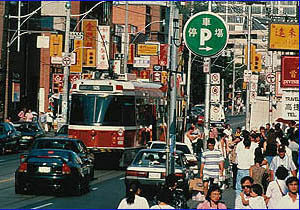 In addition to these official languages, the top 5 languages spoken in Toronto are Chinese, Italian, Tamil, Portuguese and Spanish. Streets team with shoppers, business people, and travellers in the Canadian city that never sleeps. Hop on a streetcar, bus or subway and you are just minutes from your favorite site. On summer evenings you can catch top name entertainers at the Toronto Harbourfront one-of-a-kind setting for the arts, cultural events and all kinds of activities. 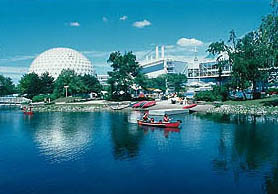 Or hop a ferry at the waters edge for a short jaunt to the Toronto Islands where you will find the best view of the city. No cars, just plenty of picnic tables and walking paths for biking, in-line skating or just strolling around the Centreville Amusement Park, a turn of the century town with rides, restaurants and shops. From mummies to marvelous masks and everything in-between, the Royal Ontario Museum known as the ROM is the place for modern day archeologists and explorers. Walk among the dinosaurs or hurry through the bat cave. Special exhibits are featured throughout the year. 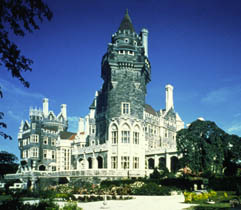 Casa Loma, the Edwardian estate of Sir Henry and Lady Pellatt is the largest Castle in Canada. Next door is another stately edifice, Spadina House, the historic 1866 former home of financier James Austin. Both are a short walk from the Cottage. And for those interested in things military there is Fort York, an early 19th century preserved historic site. On a clear day you can see a spectacular panoramic view of greater Toronto and beautiful Lake Ontario from the observation deck of the world's tallest freestanding structure, the CN Tower. Memorabilia, displays, movies, trophies and interactive attractions lets you experience Canada's favourite sport at the Hockey Hall of Fame. Slide into the SkyDome, the world's first domed stadium with a fully retractable roof and catch a major sporting event or concert. And for a dose of art, take in the world-class art collection at the Art Gallery of Ontario (AGO). Toronto shopping is an experience with something for everyone - from upscale designer shops to funky one-of-a-kind shopping. Shop at either the fashionable Yorkville-Bloor, trendy Queen St. West, the immense Eaton Centre or bargain hunt at Honest Ed's. The latest talk of the town is the Distillery District-- the Gooderham and Worts Distillery, once the largest distillery in the British Empire, which has been transformed into a thriving arts, cultural and entertainment centre. The St. Lawrence Market is a not-to-miss shopping adventure in food from around the food, crafts from 50 specialty vendors. The city boasts the third largest theatre venue in the world. The theatrical play list includes the magnificently restored threatres: the Canon, the Elgin the Wintergarden and the Royal Alex. And equally impressive is the Princess of Wales, opened by Princes Diana. Numerous imaginative and avant garde productions are performed in theatres throughout the city. And don't forget the internationally-acclaimed Toronto Film Festival held annually in September. Just a few blocks south is the award winning Tarragon theatre. And a sure fire "don't miss" is one of the city's most unique ice cream parlors, Dutch Dreams. Otherwise hop on the subway and within minutes you can be in the Skydome, the Royal Ontario Museum, Yorkville, Princess of Wales theatre, Honest Ed's or the Toronto Islands to name just a few Toronto tourist attractions. The Cottage in the City bed and breakfast is a restored turn of the century home on a tree lined residential street located in the midst of the old city of Toronto. It is close to all means of transportation: subway, bus and streetcar. The Pearson International Airport is a scant 30 minutes away. Your Toronto bed and breakfast, the Cottage in the City, is located in the unique Toronto neighbourhood of Wychwood - an area of charm and craftsmanship, early homes nestled together with grand mansions and dozens of ethnic eateries. Many of Wychwood's residents are accomplished artists and media celebrities. Your Toronto bed and breakfast hosts include a retired television journalist who has an intimate knowledge of Toronto with the expertise to make your visit a very special one! Whether you are visiting Toronto for the culture, theatre, shopping or special events, we can make you feel at home with Toronto insider tips. We feel the best part of operating a Toronto Bed and Breakfast is "serving our guests". Our comfortable guest rooms, decorated with antiques, are a peaceful oasis amidst the bustle of downtown Toronto. Meet your Toronto bed and breakfast hosts, Ron and Mardelle Kish. Copyright © 2004 Cottage in the City - Toronto Bed and Breakfast. All rights reserved. Website by Blue Cat Design & Marketing.